Same double-slit assembly (0.7mm between slits); in top image, one slit is closed. In the single-slit image, a diffraction pattern (the faint spots on either side of the main band) forms due to the nonzero width of the slit. 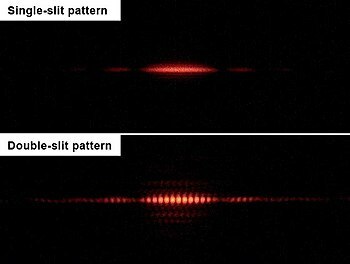 A diffraction pattern is also seen in the double-slit image, but at twice the intensity and with the addition of many smaller interference fringes.